This community on Teslin Lake was originally a summer camp and meeting place for Tlingit from coastal Alaska and British Columbia. 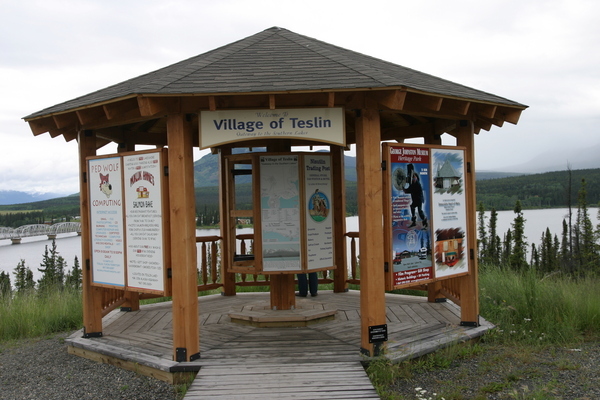 The name Teslin is derived from the Inland Tlingit word tás ten, or “long sewing sinew”, referring to the 78-mile long lake. 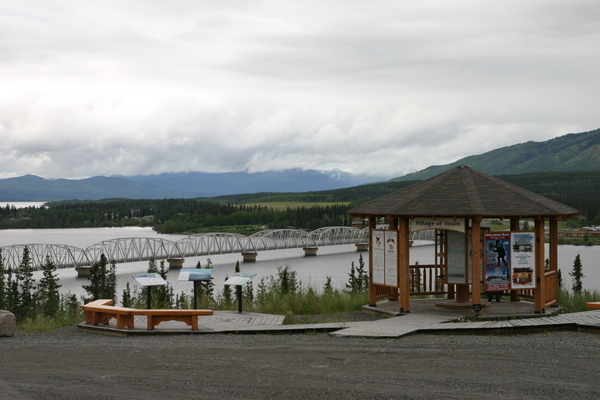 There is a day-use area and boat launch at the north end of the impressive Nisutlin Bay Bridge, which has the longest span on the Alaska Highway at 1916 feet. Eleven species of fish populate the lake, with lake trout being the most popular. In late summer, chinook and chum salmon travel up the Teslin River to spawn. The area is also good for duck, goose and moose hunting. During the 1898 gold rush, Teslin became a stopover point on the Canadian route to the Klondike. The Hudson’s Bay Company established a trading post, which closed down by 1903 but was replaced by the historic Nisutlin Trading Post. Teslin continued to grow with the arrival of the Northwest Mounted Police. In 1906 an Anglican Mission was built, which is still in use as a parish hall, and the Roman Catholic Mission was established in 1938. Today the community has an airport, restaurants, RV camping and accommodations. 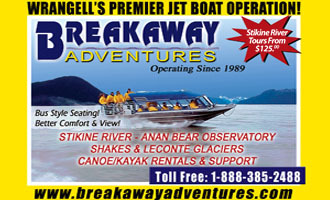 There are also boat rentals, houseboat tours, charter fishing outfitters and an air charter service. The well-stocked Nisutlin Trading Post offers motel rooms, groceries, gear and service station. The Northern Wildlife Gallery in the Yukon Motel houses an impressive display of area wildlife. Teslin has the largest Tlingit artifact collection in the Yukon. The George Johnston Museum preserves the photography of the Tlingit elder, trapper, fur trader and entrepreneur who captured the life of the inland Tlingit people of Teslin and Atlin between 1910 and 1940. Johnston (1884–1972) also brought the first car to Teslin where it is now on display, along with Tlingit ceremonial robes and trade goods. Located on the highway 1 km west of the Nisutlin Bay Bridge, the museum is open daily from mid-May to September 1. This commanding structure overlooking the lake houses exhibits and interpretive displays illuminating 300 years of Tlingit culture and history. The Great Hall at the Centre is the home of clan governance for the Teslin Tlingit people. Open daily 9-5 from June 1 to September 1 and in the off-season by appointment, the Centre is located 5 km northwest of Teslin. These clans are symbolized in the totem poles to the entrance of the Teslin Tlingit Heritage Centre and elsewhere. Political traditions distinguished Inland Tlingit from other Yukon First Nations: Tlingit people look back to a time when they adhered to strict laws rooted in their sophisticated Clan system. Ha Kus Teyea: ‘Our Way’ is what defines the Teslin Tlingit. It is the collective and shared understanding of who they are, in language, art, history and relationship to the environment. Teslin Tlingit culture formed through a history of movement from the coast to the interior. Although the Inland Tlingit integrated with their Athapaskan neighbours, Tlingit traditions, culture and social patterns remained strong, and are alive today. Today, Inland Tlingit and Coastal Tlingit people share their culture through the Ha Kus Teyea Celebration, hosted every odd year in the summer, with events such as canoeing, storytelling, cultural demonstrations and traditional dance performances. The Teslin Tlingit people are descendants of the Taku Qwan who, in the early 18th Century, moved from the coastal region of Southeast Alaska and settled inland along the shores of the salmon-rich upper Taku River. Here, they started a way of life separate from that of their coastal relatives. By the mid-19th century, the Taku Qwan gradually expanded their contacts with the people who lived on the Yukon plateau while maintaining their social and economic ties with the coast. Trading furs from the interior with coastal Tlingit, the Taku Qwan introduced the first Russian, American and European trade goods to the Yukon. At the turn of the 20th century, Tlingit people continued to move their way inland, trading goods at posts, first at the southern end of Teslin Lake and later, up the lake on the west shore of Nisutlin Bay. The construction of the Alaska Highway and Canol Road in the early 1940s brought drastic changes and prompted the semi-nomadic Tlingit population to permanently settle in what today is the Village of Teslin on the shores of Teslin Lake. Firmly established in their new geography as a distinct society, they became collectively known as Inland Tlingit.